I hope all of you have enjoyed this recent holiday break. I have to say I’ve been on Holiday Lala Land mode for much of the past few weeks! Back to normal starts next Monday. Chris has been off since last week so we’ve been making the most of spending time together with the girls. I have a number of photos from Christmas I’d love to share with you but for this post, I want to talk about New Year’s. Wow. Just a day away! 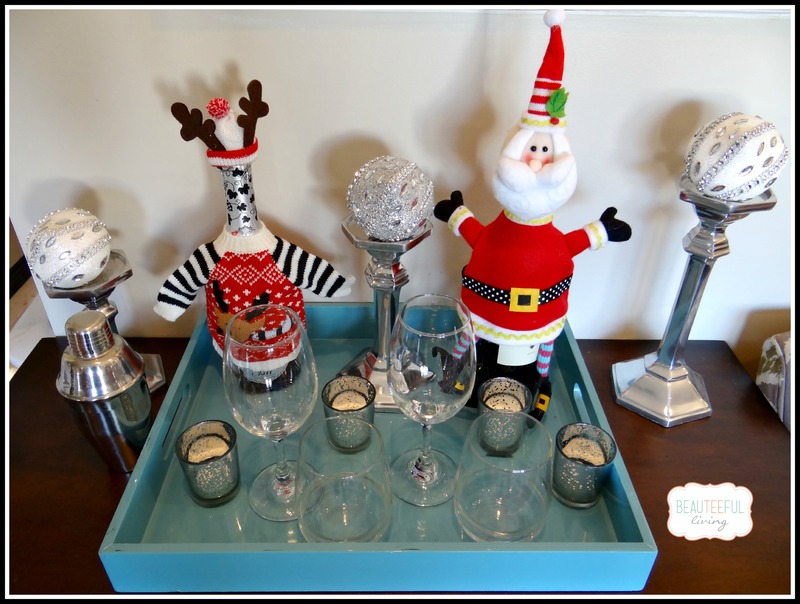 To start, here’s a little New Year’s Eve “bar” I created for the holidays with New Year’s in mind. We’re actually going to a local friend’s New Year’s eve party this evening. The silly festive wine bottle covers were purchased at Pier 1 Imports last year. Instead of placing candles on the pillars, I placed ornaments to bring more sparkle to the setting. I kept the wine glasses and bottles neatly contained with a serving tray from West Elm. This is the simplest bar setting to recreate! Now, let’s talk about being excited about the upcoming New Year. There’s something about the beginning of a new year that always gets me excited and motivated. I don’t want to sound like a perpetual optimist but being a Debbie-Downer isn’t exactly my style. I wholeheartedly believe that our attitude and the energy we bring contribute immensely to our success. Success in anything and everything. Last year on New Year’s Eve 2013, I was excited about the idea of getting this blog started. Without much of a road map but a heart full of excitement, Beauteeful Living was launched on my goal date of March 20, 2014 (First day of Spring). Today on New Year’s Eve 2014, I am even more excited and motivated regarding this blog and my vision for it in 2015. You can read all about it in an upcoming post this month. Thank you so much for joining me in this adventure! Happy New Year! This year my boys were old enough to actually understand what it means, so we let them stay up and watch the ball drop, plus we got some sparkling grape juice to celebrate. I hope everyone has a better 2015 than they did a 2014. I accomplished a lot professionally so i hope to do a lot with my health this year. Happy New Year to you and your family! This is going to be a fabulous year for all of us. Hello 2015! 2015 is going to be an awesome year…I can feel it! I love your attitude! More people need to be positive and upbeat like you! Wishing you all the best in 2015! I am really hoping to get my blog out there! Happy new year! We’ve got some trips coming up this year – you’ve done a great job with your blog in 2014! I’m just looking forward to another year with my family, it’s always an adventure! Happy New Year! I am excited about my blog growing, also I am preparing for expanding my business to grow and provide more for the people around me. Sounds great, Angela. Best of luck to you! I love that reindeer wine bottle cozy! So cute! That is a nice little setup! Those wine bottles are adorable. =) Have a great New Year! I’m excited for the many new things coming in 2015 – it’s going to be a great year. Happy new year! Happy New Year and can’t wait to see your posts in 2015! We have a few family trips planned and I am hoping for big things this coming year. Happy New Year!